I’m a sucker for buying anything kids are selling on card tables in front of their houses. I don’t care if the lemonade is watery or if the cookies are stale; I’ll buy them. Oh, the foolhardy days of my youth. Recently I drove past a building in my neighborhood, one I lived in some fifteen years ago. Behind a table on the sidewalk were three beautiful Latina girls about ten years old. On the table was not a pitcher but a curious red-and-white machine. Holy innovative beverages, Batman! Was this what I thought it was? I parked and called out to them, ‘What are you selling?’ and in unison they answered, ‘Snow cones!’ Well, sold, obviously. Ten minutes later (it really was, but who cared?) 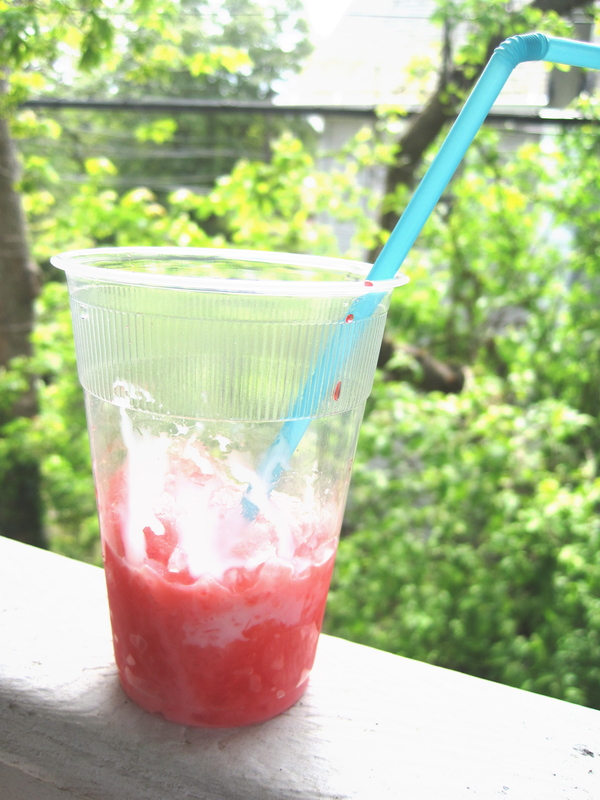 I was offered a plastic cup of crushed ice with streaky squirts of cherry and a bendy straw. One of the girls said, ‘Do you want this, too?’ She held up a little open can of sweetened condensed milk, which I use when I make caramel and which is a staple of Latin cuisine, especially in that voluptuous knockout, Tres Leches cake. ‘Of course!’ I said, and she poured some of the stuff on top of the mixture, less like a snow cone now than like a slushie with a Spanish accent (but again, who cared?) and paid them. They were so excited. Told a few friends about this, and one commented that a drink like that lacked rum and nothing else to be a perfect summer drink. While I’m inclined to agree, it really was perfect the way it was: A buck for a trip to the tropics.